Joining Hanks in the movie are Bradley Whitford as writer Don DaGradi and Jason Swartzman and BJ Novak as the songwriting duo, Richard and Robert Sherman. The three creative men struggle to please the skeptical, dry Mrs. Travers while she tries to help them and Disney understand why Mary Poppins means so much to her. Beyond just taking this untold true story and putting on the big screen, Saving Mr. Banks provides a mini biography of Walt Disney himself. During the Saturday panel, “Working with Walt,” renowned Imagineer Bob Gurr began to tear up while speaking about the film. He, and the fellow Disney legends that joined him on stage, were touched by how director John Lee Hancock and screenplay writer Kelly Marcel brought Walt to life again. Little quirks, like Disney clearing his throat to let you know that he was about to enter a room, have added a level of authenticity often lost in films like this. 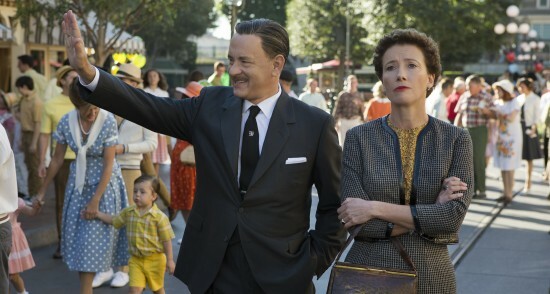 Saving Mr. Banks, due in theaters this December, is sure to be a treat for Disneyphiles and moviegoers of all ages. Perfect: Hanks and Thompson goes in nominations Golden Globe and Oscar. Typically I would not discover publish in blogs, however want to state that the following write-up really compelled me to see and practice it! Your current writing style may be impressed myself. Thank you, very terrific publish.